In the crane and lifting industry the terms heavy and heavy duty are often used interchangeably by our clients, but they have different meanings for hoist and overhead crane providers. A crane is designed to lift a specified load weight – anything within the crane’s capacity isn’t considered “heavy” as that’s what it was designed to do. Heavy is a relative term of weight based on the crane’s capacity. “Heavy duty” is a term concerned with the work performed by the equipment. Even if a crane can lift 5 tons, if it only makes one lift per week, it isn’t considered “heavy duty”. Heavy duty is a factor measured by the amount of work performed – not by capacity. Duty cycle is the proportion of time during which a crane hoist is operated. The duty cycle is expressed as a ratio or as a percentage. For example, a hoist operates for 1 minute, then is shut off for 99 minutes, then is run for 1 minute, and so on. The hoist runs for one out of every 100 minutes, so its duty cycle is expressed as 1/100, or 1 percent. The more a machine or hoist is used, the sooner it will wear out. Therefore, the higher the duty cycle, the shorter the useful life, all other things being equal. If the same hoist mentioned above has a life expectancy of 1,000,000 hours based on a 1 percent duty cycle, that same hoist’s expectancy would probably be about 500,000 hours based on a duty cycle of 2 percent, and 2,000,000 hours based on a duty cycle of 0.5 percent. Here are some other terms used when describing a hoist’s operating life. 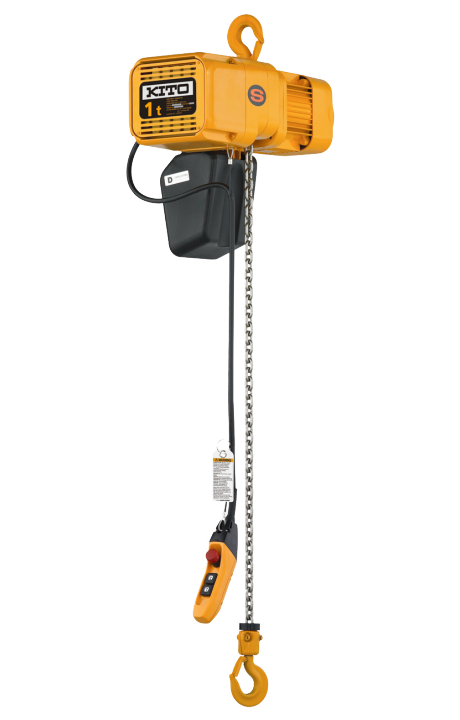 Average operating time per day – The average hoist operating time for each day. Load spectrum – The load magnitude, as a percent of hoist rated capacity, expressed over the duration of hoist operation. Starts per Hour – The number of times the hoist motor is started per hour. 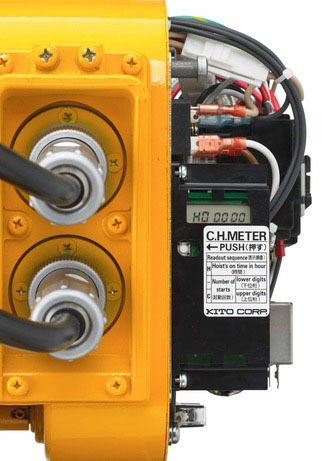 Operating Periods – The hoist operating time in minutes per hour as expressed over a work period. Equipment Life – The projected hoist life based on average usage within normal operating parameters. CMAA (Crane Manufacturers Association of America) has defined the type of service a hoist will perform. In Manitoba and Saskatchewan, CSA standards are followed, which are drawn from the CMAA standards. This service class covers cranes which may be used in installations such as power houses, public utilities, turbine rooms, motor rooms and transformer stations where precise handling of equipment at slow speeds with long, idle periods between lifts are required. Capacity loads may be handled for initial installation of equipment and for infrequent maintenance. This service covers cranes which may be used in repair shops, light assembly operations, service buildings, light warehousing, etc. where service requirements are light and the speed is slow. Loads may vary from no load to occasional full rated loads with two to five lifts per hour, averaging ten feet per lift. This service covers cranes which may be used in machine shops or paper mill machine rooms, etc., where service requirements are moderate. In this type of service the crane will handle loads which average 50 percent of the rated capacity with 5 to 10 lifts per hour, averaging 15 feet, not over 50 percent of the lift at rated capacity. This service covers cranes which may be used in heavy machine shops, foundries, fabricating plants, steel warehouses, container yards, lumber mills, etc., and standard duty bucket and magnet operations where heavy duty production is required. In this type of service, loads approaching 50 percent of the rated capacity will be handled constantly during the working period. High speeds are desirable for this type of service with 10 to 20 lifts per hour averaging 15 feet, not over 65 percent of the lifts at rated capacity. HMI and ASME (Hoist Manufacturer’s Institute American Society of Engineers) have also published hoist duty service classifications. Additional specifications can be found at their site. H1 (infrequent handling or standby use) – Primarily used to install and service heavy equipment, loads frequently approach capacity and hoist is idle for long periods between use. H2 (light use) – Primarily seen in light machine shop fabricating, service and maintenance; loads are randomly distributed. Rated loads are infrequently handled. Mostly average sized loads, only occasional max load lifting. Total running time not over 12.5% of the work period. H3 (standard use) – General machine shop fabricating, assembly, storage and warehousing. Loads and use are randomly distributed. Occasional max load lifting. Total running time not over 25% of work period. H4 (heavy use) – High volume of heavy loads, frequently near rated load in steel warehousing, machine and fabricating shops, mills, and foundries. Total running time not over 50% of the work period. Manual or automatic cycling operations of lighter loads with capacity loads handled infrequently such as in heat treating and plating operations, with total running time frequently at 50% of the work period. H5 (severe use) – Bulk handling of material in combination with buckets, magnets, or other heavy attachments. Crane’s of this class are often cab operated. Duty cycles approaching continuous operation are frequently necessary. Regular lifting of heavy loads. Exact details of operation are necessary, including the weight of attachments. The standard’s you will find are dependent on which the manufacturer follows so as a supplier we have to be familiar with both rating systems. Knowing the rating systems we will be able to suggest a hoist that provides the best possible service time for your loads. The duty cycle of a hoist is one of many factors our team will utilize when designing your lifting solution.